Brain Sentinel’s SPEAC® System demonstrated equivalence with the gold standard, video EEG, in detecting generalized tonic-clonic seizures (GTCS) using surface electromyography (sEMG). In a new study published on October 5, 2017, in the medical journal, Epilepsia, Brain Sentinel’s SPEAC® System which uses the surface electromyography (sEMG) biomarker demonstrated equivalence with the gold standard, video EEG, in detecting generalized tonic-clonic seizures (GTCS) using surface electromyography (sEMG). The prospective multicenter phase III trial was conducted at eleven level-IV National Association of Epilepsy Center sites in the US. The SPEAC® System is the first and only FDA-cleared, non-EEG, physiological signal-based system for seizure monitoring. “Validation of sEMG as a useful biomarker in the monitoring of our seizure patients gives us a new tool to help patients get their seizures under control,” said Jonathan Halford, M.D., lead author of the study and Associate Professor of Neurology at the Medical University of South Carolina. “Knowing when dangerous GTCS occur and how often is important for keeping patients safe and improving their outcomes. As we mentioned in the study, ‘This rapid detection is valuable, given that timely treatment of seizure events can be lifesaving,´” Halford continued. On February 16, 2017, Brain Sentinel received US Food and Drug Administration (FDA) de novo clearance to begin marketing the SPEAC® System, the Brain Sentinel® Monitoring and Alerting System. 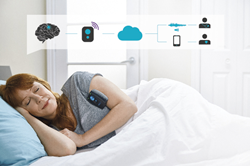 The adjunctive seizure monitoring system is indicated for adults at home or in healthcare facilities during periods of rest. A lightweight, non-invasive monitor is placed on the belly of the biceps muscles to analyze surface electromyography (sEMG) signals that may be associated with generalized tonic-clonic (GTC) seizures. It provides an alarm to alert caregivers of unilateral, appendicular, tonic extension that could be associated with a GTC seizure. The System records and stores sEMG data for subsequent review by a trained healthcare professional. The SPEAC System is currently available to the VA Health System. Brain Sentinel, Inc. is a privately held, medical-device, start-up company based in San Antonio, Texas. The company manufactures and markets its sEMG-based System under the name, the SPEAC® System: the Sensing, Portable sEMG, Analysis and Characterization System. Brain Sentinel is committed to helping people gain better control over their seizures and be heard by their physicians.